Supercote Wire is 12 1/2 gage high tensile wire covered with a very visible white plastic coating that is bonded to the wire. Unbonded coatings shrink away from the ends and from hardware fittings to expose the wire and allow moisture to enter between the wire and coating. Bonded products are more resistant to corrosion and coating damage. Supercote Wire - 1000 foot, 55 lb rolls. 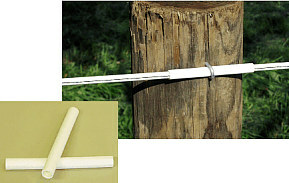 A spring and tightener can be encased in a plastic pipe (as shown below) for animal safety. Supercote wire can be tied like all MAX-FLEX high tensile smooth wire so expensive and cumbersome tools and crimping sleeves are not needed. Hot Supercote is a type of coated high tensile wire that can be electrified. The three black lines that radiate from the steel wire in the center conduct electricity because of their high carbon content. This kind of wire matches regular Supercote in general appearance (highly visible and attractive) and in safety for horses due to its larger diameter. Like regular Supercote, Hot Supercote can be installed using the same methods as MAX-FLEX high tensile smooth wire. 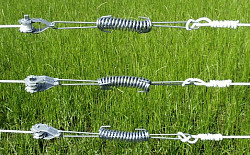 It can be used in combination with smooth wire or other fence wires. Best of all, it will fit into some standard high tensile wire insulators (like the MAX-FLEX Black WOR or White WPI for line posts and the "S" insulator for corner posts) or can be installed with special tubing made to fit Hot Supercote. Tubes cost less but must be slid along the wire from an end to every post and they provide less insulation from the post than WOR and "S" insulators. "S" corner and end insulators are now available only in longer lasting black, bags of 20.